View More In Shelf Brackets & Supports. 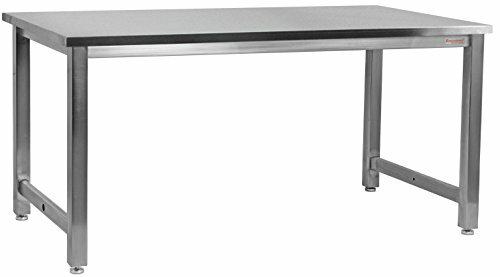 BenchPro™ stainless steel top benches are 18-gauge, grade 304, #4 finish stainless steel to eliminate the possibility of a heavy load bending the top in the center. If you have any questions about this product by BenchPro, contact us by completing and submitting the form below. If you are looking for a specif part number, please include it with your message. National Hardware N341-115 4020BC Slotted Angle in Galvanized, 1-1/2" x 96"
80/20 Inc., 1010, 10 Series, 1" x 1" T-Slotted Extrusion x 72"
EZ Align Premium Shelf Pin Drilling Jig With 1/4" And 5mm Self Centering Drill Bits, Dual Sided Shelf Pin Jig for Easy Alignment On Both Sides Of The Shelf.